The Avdeevka Coke-oven by-product plant in Ukraine is one of the largest coke-producing facilities in Europe. Some 7800 employees run the 339 hectare large production site and out of the 18500 tons of coke treated on a daily basis, 24 different by-products are received. 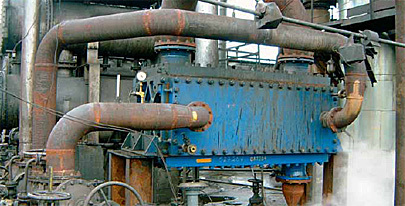 In 2003, plant management finally decided to buy one compact, fully welded Compabloc heat exchanger to serve as a dephlegmator (partial condenser) for light oil recovery. This Compabloc replaced two large S&T heat exchangers with a surface area of more than 400 m2. With the Compabloc, all issues were solved as the pressure drop before the stripping tower was reduced and the preheating efficiency was increased, preheating the bensolized oil to 100°C. A shell-and-tube heat exchanger had reached the end of its life. It was leaking frequently, and every leak meant blocked off tubes, reduced area, loss of vacuum and condensate literally going down the drain rather than being used to generate steam for the paper mill’s drying process. In addition, the heat exchanger was difficult to access and expensive to maintain. An Alfa Laval AlfaCond 400 was installed on the 6-meter floor at the mill for a highly efficient and extremely compact solution. A single Compabloc made it possible to save 100 m3 COG per hour in the burner as the preheating efficiency was increased. The extraction of benzene from the wash oil is much more efficient and we are now dismantling our two old S&T heat exchangers because we do not need them any more.